New players only. Wagering occurs from real balance first. 20 x wagering any winnings generated from free spins, contribution may vary per game. The wagering requirement is calculated on bonus bets only. Free spin is valid for 7 days from issue. Max conversion: £/$/€ 5 or 50 kr. Full Terms apply. Full Terms apply. In Arizona, a ground-breaking new proposal could lead to legalized tribal sports betting in the state. Introduced this week in the state legislature, the bill would allow tribes to offer sports wagering in limited off-reservation locations, as well as within tribal casinos. Senate Bill SB 1158 was introduced by State Sen. Sonny Borrelli (R-Lake Havasu City) and State Rep. Leo Biasiucci (R-Lake Havasu City) and Mark Finchem (R-Tucson). “This is the first state legislation for limited operation of sports betting by tribes,” Sjoberg told Casino.org. Given that tribes in Arizona are experienced casino operators, “I don’t think the tribes will have any particular challenges,” Sjoberg said. Although rural tribes may have to overcome the fact that their more remote locations may draw fewer customers, Sjoberg points out that the bill allows for off-reservation gaming. Under the new measure, off-reservation sports betting would be offered through kiosks or similar machines located in licensed bars or private clubs, much like those operated by service groups such as the VFW and Elks lodges. Given the number of tribal casinos in the state, the proposal could have a major impact: Arizona has 24 Indian casinos in compacts. Another five tribes have compacts without casinos, according to the Arizona Department of Gaming. As of last November, cumulative tribal contributions from gaming revenue to the state through the Arizona Benefits Fund was almost $1.3 billion. 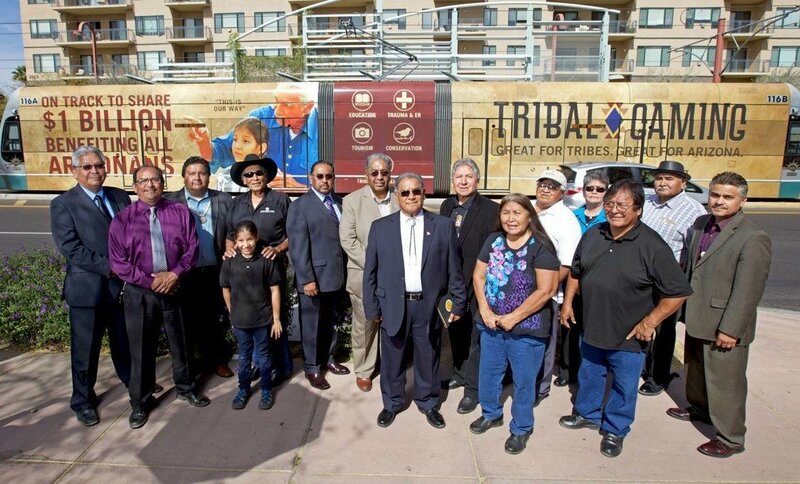 Additionally, tribes have made contributions to cities, towns, and counties of their choosing in the Grand Canyon State, totalling over $163.7 million, as of November, 2018. Total tribal contributions as of November have been $1.455 billion since the compacts began in 2004. Under the bill, off-site betting would be regulated by the Arizona Department of Gaming, which already regulates tribal casinos. Currently, gaming on reservations is regulated by both state regulators and self-regulated within each tribe. With tribal off-reservation gaming to be regulated by the state, Sjoberg this should present no problem, as tribes are used to working with state officials. In Arizona, all tribes have one form of a compact, which includes revenue-sharing with the state. The money collected is earmarked for specific areas, including education and wildlife. Tribal taxes on off-reservation betting would be at 6.75 percent of revenue, the same tax rate on casino GGR that Nevada pays. The bill has now been sent to Arizona's Senate Rules Committee to be reviewed by state legislators. The public could testify in hearings, and Sjoberg says some social conservatives — who often oppose any form of gambling — may choose to speak out against the bill. Lawmakers may choose to amend the bill as well. If it's ultimately approved by the legislature, Governor Doug Ducey must sign it into law. Finally, individual tribes will decide if they want to offer sports betting, which Sjoberg says is not an automatic assumption. State regulators will still need to license any sports betting operators, after which if they choose to go off of sovereign land, tribes could find locations with existing bars or private clubs that already have liquor licenses to serve alcohol, and sign leases or rental agreements with them. But nothing in the bill would prevent tribes from opening their own off-reservation bars where they could put the kiosks, Sjoberg said. Nor is there anything which would limit the number of kiosks put in any one bar or club, beyond the overall total number agreed to in a compact between a tribe and the state. One major point with the bill is that it continues to keep “tribal exclusivity” when it comes to gambling in the state, Sjoberg said. If approved — and if enough Arizona tribes decide to dive into sports betting — other states may try similar initiatives, too, Sjoberg confirmed, especially in those with large tribal gaming operations. The measure says that no other person or organization beyond recognized tribes can operate sports betting in the state. Moreover, it prevents wagering on NCAA (college) sports. The post Arizona Proposes Tribal Sports Betting Bill Allowing for Both On and Off Sovereign Land Wagering appeared first on Casino.org.